img. Frederik Temmermans presenting, photo courtesy by David I. Frank. 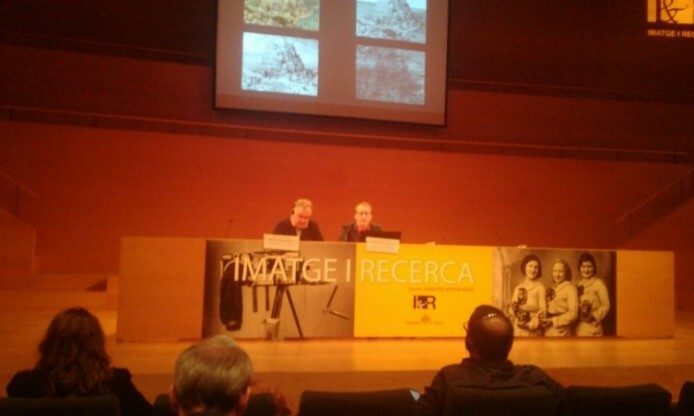 Each year, Girona hosts the important international event “Image and Research” that gathers professionals from any field of image creation, conservation and dissemination, to dicuss new challenges for archives and cultural institution about how to leverage their image assets to cope with digital age. As usual, Photoconsortium members participate in the conference, that is co-organized by our friends at CRDI. One of the opening speeches has been delivered by Frederik Temmermans (imec), about the “Intergrity of digital images” on the first day; while David Iglesias Frank will moderate a discussion space “In search of new audiences” on Friday the 23rd and also present a paper about tools for digital preservation: “El projecte Preforma. Funcionalitats i potencialitats en la perspectiva del CRDI”. Also, a paper by Frederik Truyen and Sofie Taes entitled “Telling the story: a curation driven approach to image metadata improvement and development” is included in the conference proceedings, to illustrate our experiences for metadata improvement and user engagement, particularly in the framework of Europeana DSI and Migration projects.